Ad4Pop is a potentially unwanted program that tries to entice users by offering huge variety of online games for free. Yet, the real aim of the program is to present online ads in order to gain earnings for its developer. Ad4Pop is ad-supported software that is closely related to ArcadeGiant, GamesCake, and GamingTreasure. All of them were offering free games. In include action, adventure, puzzles, and more other addictive flash games online. It may be seems thrilling, but behind such alluring offers, there is an equal effect on having this adware. The main culprit why its author created Ad4Pop is to gain more revenue. By using this program, schemer can place kinds of intrusive and irritating online ads. Most of the ads it presented may link you to malicious web site. This adware may even direct you to acquire sorts of harmful programs. In most cases, Ad4Pop acquired while computer users are installing free software. It hides and gets installed alongside with the main program. The very instance you notice unusual display of ads, coupons, or sponsored links, you may then conclude that Ad4Pop is infecting your machine. This is one of the misdeeds that normally appear when Ad4Pop adware attack. You can download and install Ad4Pop for free on its official web site. But when you did not install or request for it, and yet you find Ad4Pop on your system, you have to act on it more quickly. More issues like invasion of privacy and even identity theft can be happen soon. Mind you that Ad4Pop is able enough to gather and steal all of your precious details. Then, those data can be used for advertising purposes and for other malicious intent. The only key to keep your computer and privacy at safe side is to remove Ad4Pop completely. - Control Panel window will open. Please proceed to the next step which is uninstalling Ad4Pop. 4. Select adware relevant to Ad4Pop or any suspicious items. Then, click on Uninstall button to remove it from Windows. To remove Ad4Pop, download MalwareFox Anti-Malware. This tool is effective in getting rid of Trojans, viruses and malware. 1. When troubleshooting a PC, one common step is to boot operating system into Safe Mode with Networking. The same approach will be used in the removal of Ad4Pop. Please execute instructions based on your Windows OS version. To make sure that no more malicious files linked to Ad4Pop are inside the computer, we must run another effective scanner. This time, use Junkware Removal Tool. No installation is necessary with this tool. 6. After scanning the computer, JRT will open a Notepad containing scan logs. It may have not find Ad4Pop relevant entities, but it will surely delete any malicious items not found in the previous scans. 4. At the bottom of the page, click on Reset settings to remove all changes made by Ad4Pop. 4. In order to reverse modifications caused by Ad4Pop, click on Reset button to bring back Internet Explorer's settings to their default condition. 3. Click on Refresh Firefox button to erase the effect of Ad4Pop. 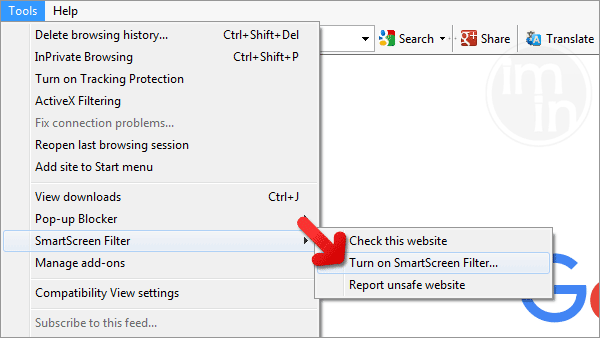 SmartScreen filter is a built-in feature in Microsoft Edge browser that can help you deter malicious programs such as Ad4Pop. It can block malicious web sites and downloads.